The world's largest atom-smasher could help physicists understand mysterious dark matter in the universe, and later this year it may offer a discovery even more fascinating than the Higgs-Boson, researchers say. 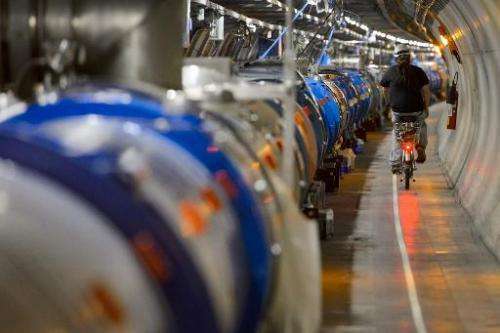 The Large Hadron Collider, built by the European Organization for Nuclear Research (CERN), has undergone major upgrades this year will begin its second, three-year run. CERN says that after a two-year break for upgrades, the LHC will be twice as powerful this time. The collider is already credited with helping physicists discover the elusive Higgs boson, which helps explain how objects have mass, and which led to the award of the 2013 Nobel Prize for physics. This year, the atom-smasher will restart at a beam energy that is substantially higher, with the goal of better understanding why nature prefers matter to antimatter. A new discovery "could be as early as this year... if we are really lucky," said Beate Heinemann, professor of physics at the University of California, Berkeley, during a talk on Saturday at the American Association for the Advancement of Science annual meeting. Heinemann is a member of the ATLAS research team at the LHC. "Maybe we will find now supersymmetric matter," she added. "For me it is more exciting than the Higgs." Supersymmetry is an extension of the standard model of physics that aims to fill in some big gaps regarding how scientists understand matter. According to the theory of supersymmetry, all particles have a counterpart that is heavier, and experts believe that if these partner particles are there, the LHC should be able to find them. Since the standard model of physics cannot explain the existence of dark matter, which is thought to hold galaxies together and account for most of the matter in the universe, supersymmetry aims to offer "a more comprehensive picture of our world," according to the CERN website. The first of eight steps toward getting the LHC started again began on December 9, and is expected to take several months. Because your irrational need for a new model is science? If there is not proof of such a model, why should someone let people think it will be discovered while there is yet no experimental demonstration the current standard model cannot explain all the known facts. Dark matter is still an hypothesis, even if it is a serious one, nobody has demonstrated its existence so far. Do you know about scientific revolutions? They occurs when enough experimental data has been accumulated to debunk a current theory and support another one. Here, the Standard Model is still doing well despite some indications it is not complete or it is not accurate. Baryonic matter massing between 55 g and (9.43±0.07)×10^20 kg (~mass of Ceres dwarf planet) has not been ruled out as DM candidate. A pretty dramatic headline for an article that simply says the LHC will be turned back on this year. Yes it has. Baryonic matter as a whole has been ruled out, whether "cold" or "hot". They also might find nothing. And that would be something, too! It has been ruled out by those who do not understand the electrodynamic properties of the matter they study. Astrophysicists "believe" that only gravity can operate at cosmological scales, thus they must invent an ad hoc magical fairy dust to explain the observable reality. A modern understanding of plasma must be applied to describe what we observe. Remember, the gas models astrophysicists use were developed in the gas light, horse and buggy era. Properly derived plasma models don't require fairy dust to repeat reality. I blame the janitors at CERN for these random particles. they could be donut crumbs or powdered sugar, or dandruff from one of the over-educated theoretical scientists who spend their lives peering so deep into the unknown that they have to speculate what's in there, then revise their speculation when something isn't there, or is that they weren't expecting to find. CERN love to pretend they'll get their next sets of "OMG we found it" promotional line for additional funding ahead of "What the heck is that" miscalculated line. The fact that none inside CERN really know what they're doing, except, well turn the universe upside down as their Higgs Boson fails to support today's reality ( the Big Bang sustaining contrary to Higgs Physics collapsing after the bang). Come on now, who wants to be fooled again? Nice opinions. How many of you are theoretical physicists that you can challenge the validity of this article? What do you know about how CERN is funded, or any scientific research for that matter? Let us know when you have your PhD in theoretical physics and you have at least a couple of research projects that have passed peer review and have been published. Now your ready to "TRY" to disprove what this article is about. It takes a lot to hold anyone's interest these days. There once was a time when physicists's minds boggled with incredulous disbelief at the discovery of the electron. Something more finely divided than an atom. ps. Shouldn't the LHC be referred to as a 'nucleon smasher' rather than an 'atom' smasher? Woahaow Doug my friend I am impressed, high five on that. So now you get that baryons are bonded states particles and that their rest masses are mostly a relativistic effect versus fundamental particles who gets their mass from the Higgs field. For the tip of the hat, anybody who makes reference to prof. Suskind deserves that much. It is also a big step away from Smolin's word salad http://www.ted.co...guage=fr Zzzzz! That is the first time that I have seen a TED talk edited down to 12 minutes. Here we go again. Can't drive and his electric universe. Todays astrophysicists are all wrong and cant's drive, who has no degree in anything, is right. When you make these insanely ignorant statements, no one is going to believe you. Tesla's electric universe was proven wrong years ago, yet idiots like you still try and keep it alive because you do not have any basic education in physics. Please quit embarrassing yourself. Wait, don't stop, you do provide some small bit of entertainment for us. Although Tesla is likely the greatest applied scientist ever, the EU is more based upon Birkeland's and Alfven's discoveries. If you have a degree, it doesn't seem to be saving you from preaching from your pulpit of ignorance. cantdrive, stupid as ever. Continue to show everyone you know nothing about what your talking about. Do you even have a degree in science? I seriously doubt it. If you say you do, your lying out your ssA. It's people like you who give science a bad name. Your no physicist or scientist. But please, continue showing people you are just another useless troll who interferes with the discussion of the subject of this article. I hope Large Hadron Collider (LHC) will finally work because the past failure was really embarrassing after spending close to $20 billion. Especially because Higgs particle evidences were very weak as Danish researchers showed last year, not enough data to say conclusively anything. As far as Dark matter is concerned, they better hurry since many reasonable, simple alternative explanations are multiplying including one by Edward T. Kipreos of University of Georgia, Athens, GA, USA who uses Absolute Lorentz Transformation (ALT) to show that Hubble expansion rate is not really accelerating therefore there is no need for dark matter or dark energy to explain observed red-shift data if organized via ALT. This paper, based on very interesting conjecture (supported by some evidences) that, in the past, "time" was passing faster then today, deserves closer scrutiny. The idea is based on so called correction for time dilatation (td set to zero) so we have simultaneity of time events between (preferred) frames of references. In cosmological context it means "apparent" finite blue shift, if data organized using ALT for Doppler read-shift observations of galaxies was stronger in early universe and weaker now, compensating for apparent artifact of acceleration of universe expansion. While these assumption do not violate speed of light limitation it introduces notable asymmetry in light propagation, definitely challenge to theory of special relativity. Big bang community seems to be unusually quite and uninterested, it seems that they are set for dark stuff one way or another with LHC or without. Published in PLOS ONE. In Dec 2014. This author is not doing a good job. Besides writing your job is also to evaluate what you write. The standard model is junk! The model has not included space as a particle, mass as a particle, the first particle, or the particle it decayes into. Instead it is trying to find dark matter which doesn't exist. And the facts related to DM, stronger gravity arn't examined for other causes as energy chains. A very simple theory which works for ALL cases in physics. But in fairness, may be as good as the next writer. May I add the standard model does not state mass for the neutrino. The masses for the three neutrinos are .04,.08 and .12ev. The important part of these three values is the differences in the masses. The differences are the values of the mass !!! Now the author has a good story with out the LHC. ...all except the high IQ part of course. Come back when you have an actual argument, rather than the childish name calling you have resorted to. Thanks. All particles are built from 3 preons Preons are one of 3 frequencies, (LHE) low, high, extreme and differ by 10**20. There are 4 particles in the space table (LLL). Ferimons are (LLH), Bosons are (LHH) and mass is (HHH), the first particle (Eu)is in (HHE) and the particle it decays into is Supermass (Sm) in (EEE). There are 10**105 space particles in a cubic meter. A way to look at this is think of a photon, it goes from space particle to particle in T time. The lenght moved is the lengtk (L)of the space particle. and L/T is C, and ONLY C. The energy densities of space ,mass and supermass are each 10**60 times different. The universes was built from 10**50 Sm particles. But I can go on along time, Hope that helps. The theory predicts the Higgs2 mass at 140.6 Gev. that's way ahead of LHC. The 3 preons are all one dimensional and at right angles to make a volume. Time is discrete and the preons may be shifted in time at 180 degrees for charge and 45 degress for color. Now you can easily build all particles. If you wonder why 4 space particles, I did too. But you need them because while the first space particle is massless the other 11 (cause each particle has 3 mass states) contain a great deal of mass and are only found in a "black hole" and cause that hole to be stable, not a singlarity. Boy this author is geting better and better. I always find it hard to answer back to you; you are seeking for reasons when I am satisfied to understand the causes. Still, it is good to know that you have some credible sources in your epistemological quest and if it is turtle all the way down, you must know that down is Planck length. For me, looking for reasons is very much a Münchausen trilemma and finding a teapot in orbit around the sun will not change the laws of physics. All this to tell you that, in front of our limited perceptions and intellect, skepticism is a healthy position to keep. Have a good day mister Huffman. If you would like your oun theory, and a pretty good one at that, you are more than wellcome to use this one, please do so and get ahead of most other people. There is nothing like space is a particle or preons ! It has no infinities, no doubling of space, no dark matter, no general relativity, multiple universes or QM and only a little special relativity. Really dosen't need math either. Plasma Regulated Electromagnetic Phenomena under magnetic fields -at the Milkyway must clear these conundrums .Welcome Interaction. Now it may touch the speed of light ( more than c ) when energy is 14TeV . Thus the particles may attain speed more than that of light. It is equally feasible. It would make many theories obsolete. Chinese scientists are preparing such far more energetic experiments but that may take time. But scientists have should not worry for this. I have given alternative theories to basic phenomena. But scientists have should not worry for this. Scientists aren't worried whatever the experimental outcome. experiment trumps theory - always. As a scientist any experiment is win-win. Either you get higher confidence you're on the right track or you get to go back to the drawing board and play with wild ideas. Both makes you feel good. As for the rest: reported for spamming commercial ads. Can someone explain to me why this is not just a big fishing experiment, but the hook gets larger and larger and only the bigger fish are caught? They did not predict the mass of the Higgs and they just knew if they used higher energies they would find it. Well how do you know that if you keep on using higher and higher energies you will keep seeing clusters (e.g. energy spikes). My understanding is they did find a spike but even the breakdown products were not fully predicted and there is an unusual one or two. As we keep going higher and higher there are going to be energy spikes.